This month's technique is called Bouncing Brayer Technique! It's a really fun and you can do a lot of different things with it as you'll see from the Totally Techniques Design Team! This was my first time trying this technique...what do you think? At first, it may not look like the Bouncing Brayer, but check out my instructions / mini tutorial below and you'll see how it can be used; and for me it's camouflaged in the Timeless Elegance Designer Paper and then somewhat covered with the Whisper White frame. Start with a scrap piece of Very Vanilla card stock and use the Bouncing Brayer in Crushed Curry, then add Calypso Coral and then add Watermelon Wonder (as in the pictures below). 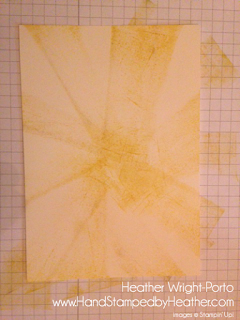 Then rinse the Brayer and then go back and add more Crushed Curry to desired brightness. This is practice! And you'll then stamp butterflies on them in Basic Black in (so the paper and practice isn't wasted!). Cut out the butterflies and you'll adhere them last. Then do the same Bouncing Brayer technique and coloring on a piece of Timeless Elegance Designer Paper. Cut a piece 4 x 5-1/4 piece of Whisper White and use a medium Label framelit to make the frame (that was used frame the roses in the Timeless Elegance Designer Paper in the images above). 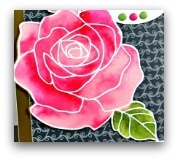 Then use the Mosaic Texture Impressions Folder to add embossing to the Whisper White card stock. 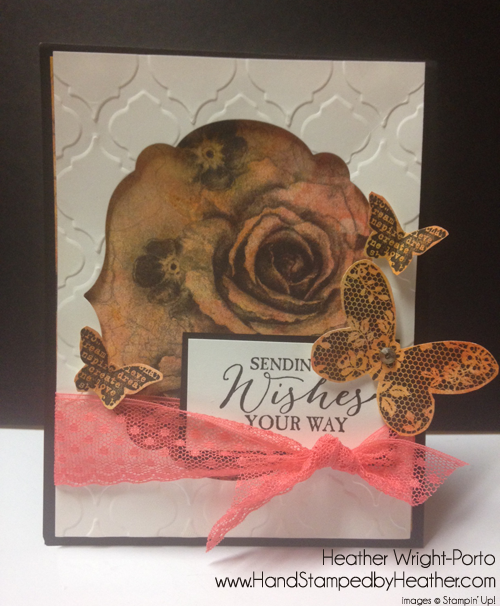 Then adhere the Whisper White embossed paper onto the Timeless Elegance paper using Stampin' Dimensionals. Run a piece of Watermelon Wonder lace ribbon through the panel and tie in a knot. Then adhere the focal point to the card base (which is in Basic Black). Stamp, mat and adhere the greeting. Adhere the butterflies where desired (using Stampin' Dimensionals). Add some bling! I have one Rhinestone on the large butterfly. Start with some paper and then your lightest color. In my example, I used Crushed Curry. And roll and lift, roll and lift, roll lift (bouncing). 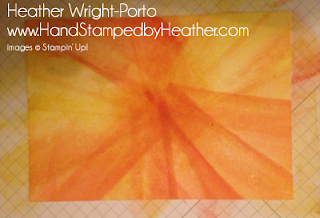 Then ink the Brayer with the next color, such as Calypso Coral in this example. Roll and lift, Roll and lift. Bounce as desired. Then add another ink, Watermelon Wonder. I actually did roll on scrap paper a few times so the Watermelon Wonder wouldn't be too dark. Then I actually washed the Brayer and added more Crushed Curry to brighten and finish. 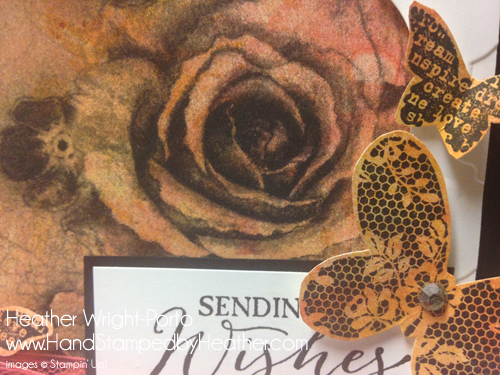 Then I stamped some butterflies from Butterfly Basics stamp set and cut them out (to later adhere to the card focal panel (with Stampin' Dimensionals). 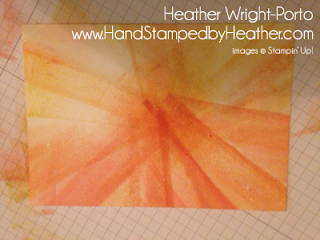 NOTE: Because I chose the darker, rose pattern in the Timeless Elegance Designer Paper, you don't see the center area where the end of the Brayer meets, like a star burst. I also did a little lighter. But you can see how you can make the color really pop if you want to! 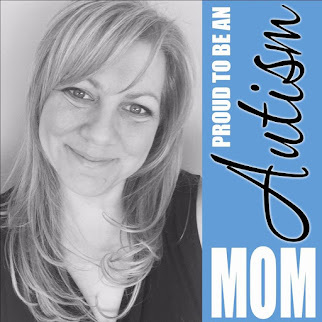 Heather Wright-Porto --- you are here - thanks for visiting me! Looking to learn more Techniques? Yes? 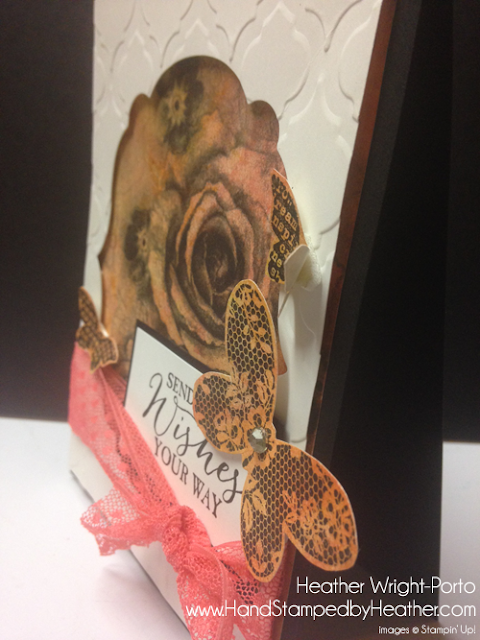 Then make sure you're following me here as a Totally Techniques Design Team member we'll be featuring a new technique every month! But over at Stamping and Blogging....we have over 60 Techniques (Video and PDFs) for you to learn in Stamping and Blogging. Do you know what the name of this one is? Come join us today and find out! So brilliant to stamp on the designer paper - I would have never thought of it! Loved how it turned out. Thanks for sharing such a unique way to use this technique! Gorgeous card Heather :-) love how you used the technique on DSP and for creating the butterflies, double whammy. So are so smart....what a great way to showcase this technique. Very pretty Heather. Brillant idea Heather....stamping and cutting out the image is the bomb! Thanks for sharing. I love your take on this technique Heather and using it with the DSP is inspiring! Genius!